Did Skydive Dubai do enough communications following the tragic death of skydiver Majed Al Shuaiby? There are days I love my job as a communicator. And then there are days when my heart breaks. One of those days was last week, with the tragic news of a death at Skydive Dubai. Majed Al Shuaiby was an experienced skydiver – he had over 700 dives under his belt according to the local media. On April the 30th Majed took to the skies. Unfortunately, his parachute did not open and he died on impact. This news, as sad as it is, is also newsworthy. We have a young man, who is only 35 years old, who perished whilst undertaking a sport which is often thought of as high risk. The accident made the news, with coverage nationally and regionally (Majed was a Saudi national). Unsurprisingly, the news first appeared on social media, on the evening of the 30th, the day of the accident. In a tribute Majed’s name trended on Twitter in Saudi with the hashtag #ماجد_الشعيبي. Many of those who were online and who knew of the accident started to reach out to Skydive Dubai. The initial reaction was, to put it mildly, disappointing. What Skydive Dubai did, a day after the accident, was put up a post on its Facebook Desert Campus page and push users there. There’s no separate post on Skydive Dubai’s main Facebook page and no posts on Twitter. The holding statement above has been used for media attribution as well, as can be seen from The National’s story. Was the statement from Skydive Dubai enough or could they have done more? While the investigation is still under way to determine what happened, could Skydive Dubai have done more to publicly address the incident and offer their condolences to the family, whilst also addressing concerns around the safety of skydiving? No one wants to go through a crisis, especially when people are injured or there’s a fatality. However, we as communicators are on the front line to advise our employers and communicate in a way that is respectful, that comforts, and that shows we are also human. As we say, perception is reality and Skydive Dubai’s initial response, to block users, would seem entirely at odds with what communicators should do in a crisis. Going beyond that, is a holding statement enough? We need to present both the facts and show our emotion. We should never simply ignore bad news, and block conversations. Could Skydive Dubai have done more? Do let me know your thoughts. On a final note, I’d like to convey my condolences to Majed’s family. Allah yurhamu and may god bless his soul. This entry was posted in Journalism, Public Relations, Saudi Arabia, Social Media, United Arab Emirates and tagged crisis communications, Emirates247, instagram, Majed Al Shuaiby, Skydive Dubai, the national, twitter, ماجد الشعيبي by alexofarabia. Bookmark the permalink. I completely agree with your views here, Alex. I too struggled to look for Skydive’s official statement. I learnt about it through dailies. What pains me is that a brand can celebrate risk, exhilaration, excitement and all things adrenaline, but when a tragedy strikes, you suddenly go silent and and discourage public queries. It seems almost automatic these days to create a high-quality video, with props mounted with cutting edge technology and posts pumped with lots of media money for greater penetration. But the moment the brand is faced with a ‘human tragedy’, they seem to be at a complete loss of words, or worse, don’t wish to say anything. The Malaysian Airlines tragedies should be a lesson for every brand, especially ones that lean towards risky enjoyment. It’s easy, especially in this region, to simply state that investigation doesn’t allow for a comprehensive statement. Investigations don’t dictate how bad you feel about the loss, or how you lead the way to console the family members of the deceased or raise awareness on the unfortunate loss. Thank you for writing this, Alex. Thank you for your thoughts Sheikh Rehmatullah. From reading about him, it seems that Majed was a seasoned diver who was doing what he loved when he died. 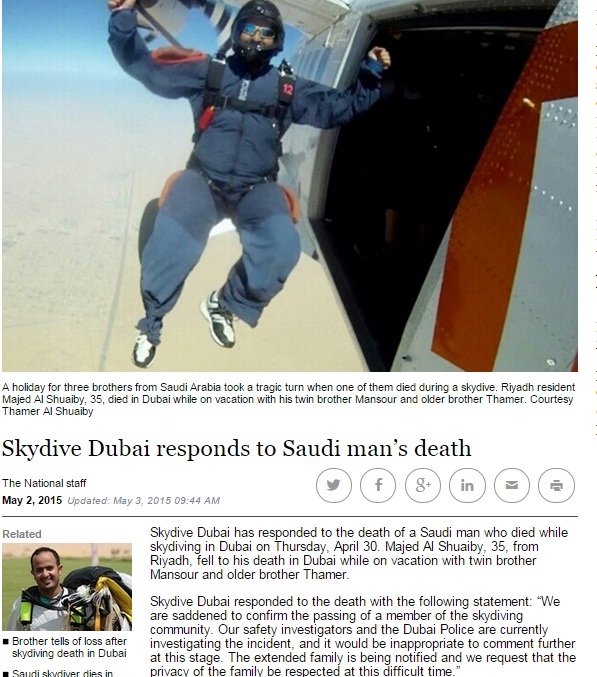 It hurts that he hasn’t been honored more by Skydive Dubai, no matter who is responsible. We are all human, we need to empathize and be there during a crisis to support the family and friends of the deceased. Your comments are touching. Thank you once again for taking the time to comment so eloquently. Thank you for responding, Alex. Appreciate that you’re proactive in responding to comments too. Here’s hoping to witnessing more human element to communications in the region. Also, I’m wondering if a piece of #EtisalatChallenge is on the cards. Thanks and best wishes, Alex. #EtisalatChallenge is coming soon Sheikh 🙂 I hope you will enjoy reading it.